Dubai Mall is the largest of the city’s two huge shopping complexes. It’s the place to come for endless shops selling everything from basic items to designer fashion. In Dubai though, malls are never just about shopping, they’re also about entertainment. There’s the impressive Dubai Fountain here, the entrance to the Burj Khalifa, the huge Dubai Aquarium, a large ice rink, a dinosaur exhibit, kidzone and even an A380 flight simulator. The water fountain can be found in a huge pool outside the mall. 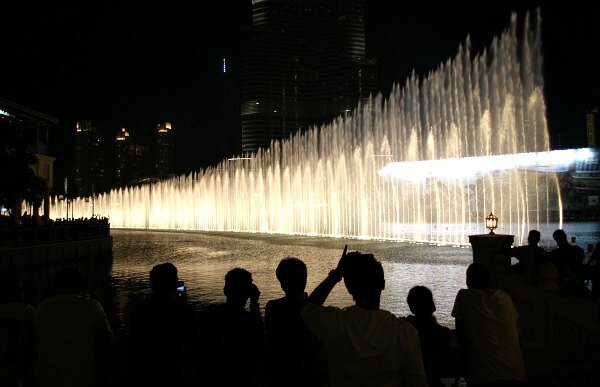 It’s in the style of the Bellagio fountains in Las Vegas and every half an hour during the evening they ‘perform’ to music. Sometimes it’s a film theme, sometimes a pop song and sometimes an Arabian influenced tune. You’ll need to secure your viewing place around the lake with 5 or 10 minutes to go as the crowds can be several people deep at times. The fountain performs twice in the daylight too at 1pm and 1.30pm although it seems more spectacular at night. The evening performances begin at 6pm and occur every 30 minutes until a final show at 11pm. 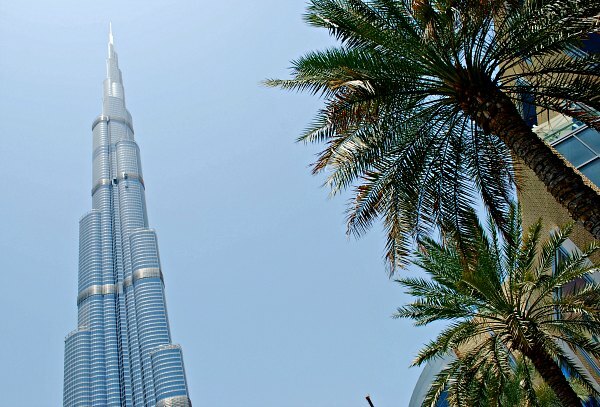 The futuristic, rocket shaped Burj Khalifa was completed in 2010 after 6 years of construction. It has 160 floors and stands at a height of 828 metres. To be honest, it’s hard to get a sense of just how tall it is from the ground, so the best thing to do is pay the fee to head to the top and look down instead. The entrance to the ‘At The Top’ attraction is inside Dubai Mall. You’ll need to book in advance though as tickets are generally sold out for several days ahead unless you want to pay a hefty premium. More about Burj Khalifa. 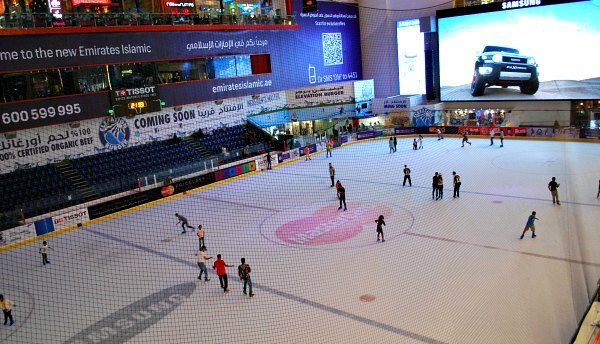 Dubai Ice Rink is an Olympic sized rink located within Dubai Mall. Regular public skating sessions take place, some with music from 55 AED per person with mega skating lessons also available from 80 AED (2014 prices). The rink is open during normal Dubai Mall opening hours. 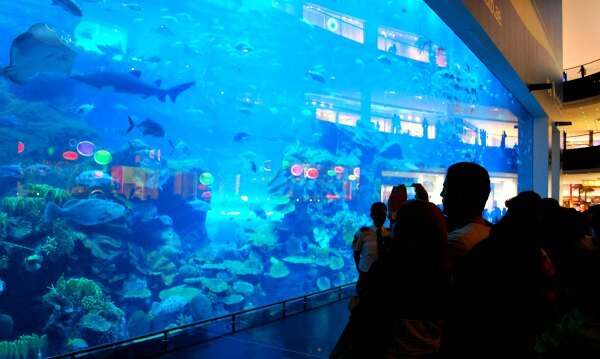 Dubai Mall is home to the one of the world’s biggest aquaria with a 48 metre walk-through tunnel at the bottom. You can see the fish and sharks for free from outside the attraction, but there’s much more to see if you pay to go inside. Once you’ve walked through the tunnel, you ascend two floors to the zoo area where you’ll find all kinds of underwater creatures including penguins. More on Dubai Aquarium & Underwater Zoo. Of course Dubai Mall is also home to hundreds and hundreds of shops with all the biggest names in clothing, electronics, shoes and homewares etc. 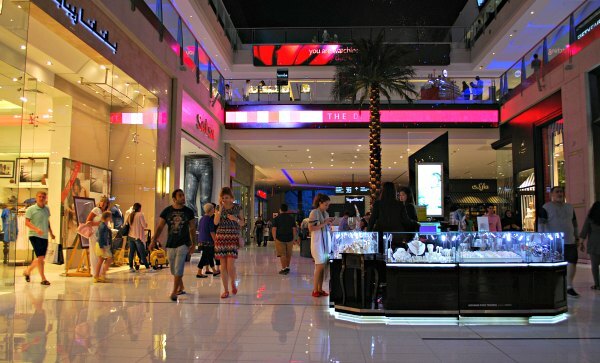 Dubai Mall is open from 10 daily till 10pm weekdays and 12 midnight at weekends. Dubai Mall has its own stop on the Dubai Metro. There is a covered air-conditioned walkway from the metro station to the mall. 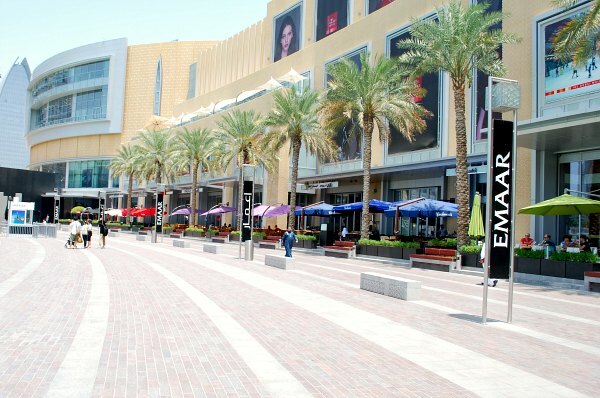 The Dubai Hop-on, Hop-off Bus Tour also stops at Dubai Mall.